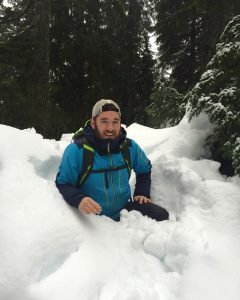 Patrick is the Assistant Manager and Training Coordinator at Patagonia Vancouver. In his role as training coordinator he is responsible for the creation and implementation of all training programs for new employees. Through this training Patrick is able to pass on his love for all aspects of product knowledge; including fabric development, technical design, and sustainability. Bringing this focus to the floor every day has helped the Patagonia store flourish as a centre of community activism and awareness, contributing over $100,000 to local environmental groups since they opened in December 2014. As a leader in ethical and sustainable fashion, Patagonia continues to embrace its role as an inspiration to other businesses in the fight to combat the environmental crisis. In working with partner companies, they have worked to develop new concepts such as neoprene free wetsuits and recycled insulations that both shrink the environmental footprint of their products and maximizing technical performance. Patagonia is also a founding member of 1% for the Planet, wherein they dedicate to donate a minimum of 1% of sales to local grassroots environmental organizations.